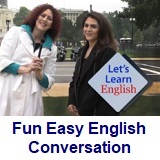 ﻿ Fun Easy English - new classroom free online classes english language lessons speaking listening writing reading march 20. Today in the Fun Easy English classroom you will learn about homonyms. Hi. In the classroom today you will learn about homonyms. Homonyms are two or more words that have the same sound and often the same spelling but differ in meaning. For example the word BANK can be an embankment or a BANK, a place where money is kept. Another example would be FLOWER and FLOUR. Other examples would be RED and READ, or LED and LEAD. Still another example would be REED and READ. Knowing the differences between these words is extremely important and will be good for your English pronunciation and writing. Note: A homonym is actually one of a group of words with the same spelling and the same pronunciation but have different meanings. The term "homonym" is often used to refer to words that are either homographs or homophones which is the case in this lesson. Homographs (literally "same writing") are usually defined as words with the same spelling, regardless of how they are pronounced. Homophones (literally "same sound") are usually defined as words with the same pronunciation, regardless of how they are spelled. Studying homonyms, homographs, and homophones is actually really good pronunciation practice. Very often English language students pronounce words incorrectly because the spelling of a particular word is the same as another. For example in the following sentences the word read is pronounced differently. In this example read is a homograph. You can see why studying homonyms, homographs, and homophones is very important. This is a test of your understanding of homonyms. 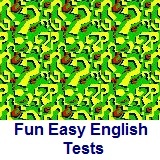 For each question decide which is the correct word to fill in the blank. There are 50 questions. Good luck. 1. A ________ is a type of tall, slender grass. 2. After lunch, she noticed the ________ in her pants. 3. I think you ________ to get a new pair of shoes. 4. He was much ________ after taking first place in the competition. 5. A computer usually has a model number and a ________ number. 6. I ate a ________ for lunch. 7. It is common to ________ when meeting for the first time in Japan. 8. The king talked to his favorite ________ almost every day. 9. A ________ is the basic unit of storage capacity in a computer system. 10. It is ________ hot today. 11. I had to ________ 16 potatoes for the party. 12. The ________ is located on the belly. 13. Many people go to the ________ during the summer. 14. I often call my friend my ________. 15. Maybe you ________ too much food last night. 16. The ________ trees are really beautiful during the summer. 17. I usually eat ________ with butter for breakfast. 18. Please read the story ________ to the class. 19. Recently, a ________ ring has become very fashionable. 20. She ________ the group through the mountains. 21. The mountain ________ is about an hour away. 22. I think you need to ________ your plans since it is raining today. 23. You can ________ many birds in the park this time of year. 24. The high ________ was earlier today. 25. The mountains are my favorite ________ to go hiking. 26. The room was ________ except for a table and four chairs. 27. She decided to eat ________ pieces of bread. 28. There has to be an easier ________ to get there. 29. She has a ________ on her foot. 30. She ________ the bus and had to wait 30 minutes for the next one. 31. The clothing store has a big ________ today. 32. Many people ________ when they go to a religious service. 33. That restaurant is famous for serving a bigger than average ________. 34. You have to ________ that garbage away with a truck. 35. There was a loud ________ from the class when they saw their exam scores. 36. The class ________ a mess. 37. The sunset was an incredible ________. 38. She liked ________ from the beginning. 39. Usually the ________ students complain about getting too much homework. 40. That was a ________ movie. 41. She felt ________ when she closed the door on her finger. 42. They ________ about the sale and decided to go shopping instead. 43. The ________ is actually a star. 44. I think that was a ________ trade. 45. The supermarket is located on the opposite ________ of the street. 46. There is only one ________ answer to the question. 47. Some people like an ________ seat when they go to the movies. 48. The ________ spent all afternoon sleeping in the barn. 49. They had an interesting ________ to tell after returning from their vacation. 50. The couple reserved the honeymoon ________ at the hotel.